Replace standard light bulbs with ENERGY STAR® LEDs. Access to safe and reliable utilities services has been one of the hallmarks of Fort Collins living for more than a century. In the 1880s, soon after Fort Collins was established, the city's citizens and public officials became adamant about creating a system to provide the community with dependable water, sewer and power. Concerns about typhoid fever, coupled with two devastating downtown fires in two years, led to the creation of the city's first waterworks in 1882. Fort Collins Light and Power Company organized in 1887 to provide an electric lighting system. A city sewer system was underway in 1888, with five sewer districts formed by ordinance in 1891. As Fort Collins continued to grow, bolstered by a successful farming community and the reputation of the town's new agricultural college, utilities infrastructure grew along with it. The city established a Public Works department, and in the early 1900s, obtained senior water rights and built the Poudre Canyon Treatment Plant. 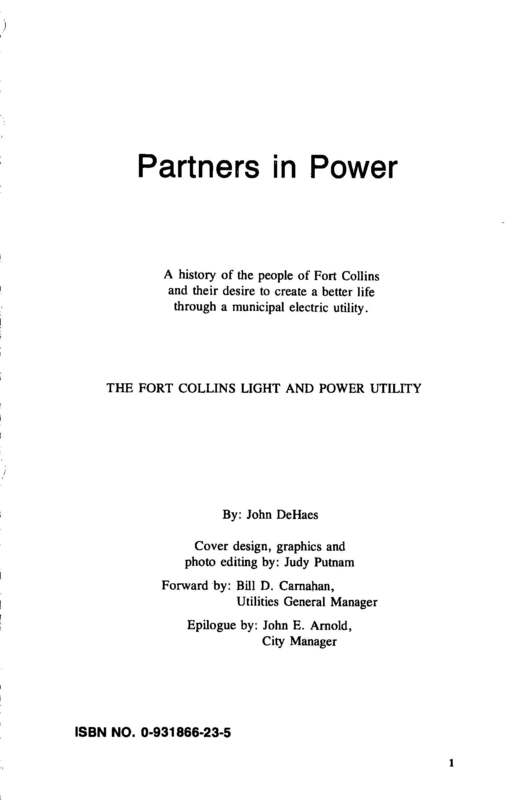 A municipal electric utility wholly owned by citizens, Fort Collins Electric Utility, was created by public vote in 1935. In 1938, city ordinance created the Department of Utilities. 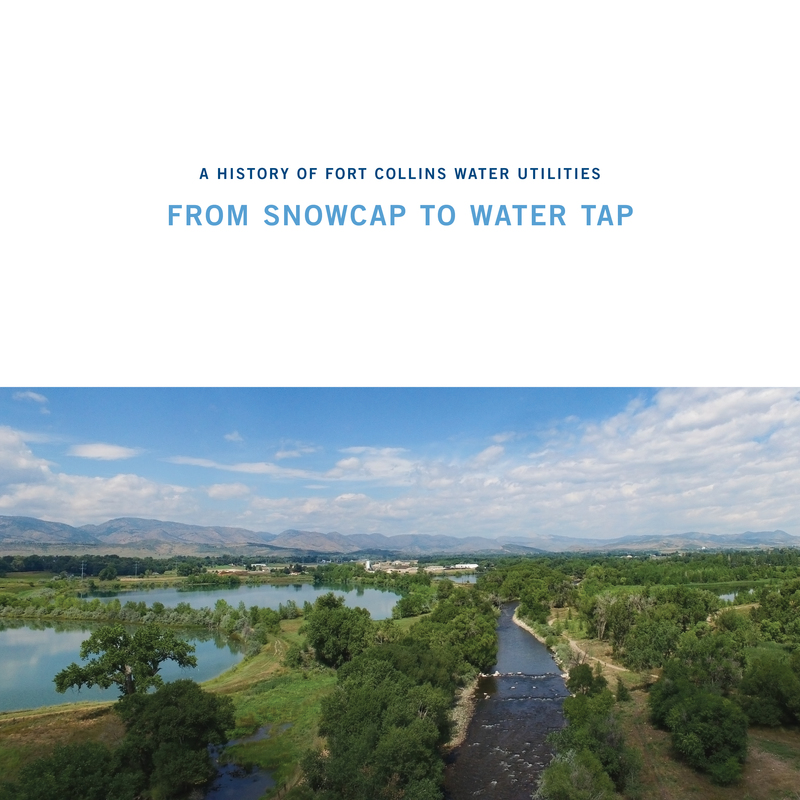 Fort Collins completed a sewage treatment plant in 1948, and began experimenting with underground light and power distribution systems the same year. In the late 1960s, the Soldier Canyon Water Treatment Plant was constructed. In response to increasing demands on the water supply, the city obtained and improved Joe Wright Reservoir and Michigan Ditch in the 1970s. 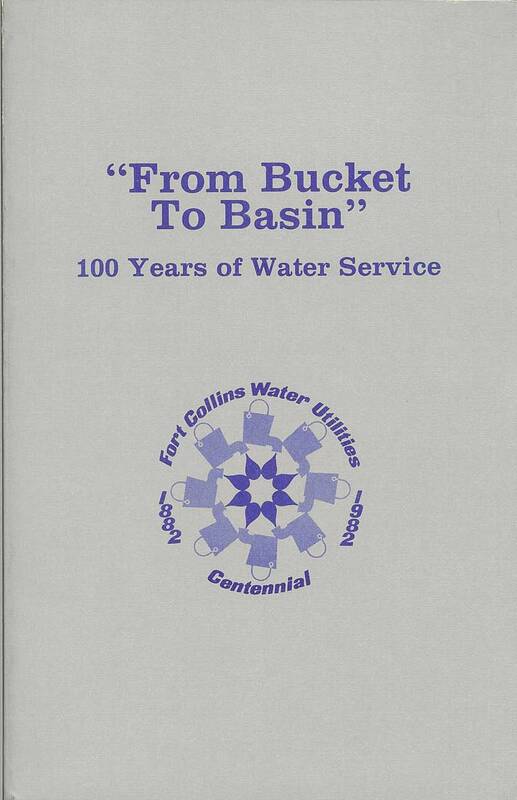 Fort Collins enacted some of the first city ordinances related to water conservation in the late 1970s and began putting into place the foundation for a comprehensive water quality plan. The Poudre River floodplain was first mapped in 1975 in an effort to better assess flooding risk, and in 1980, out of concerns about flooding in the community, the City Council established the Stormwater Utility. In the early 1980s, the first basin master plans were developed to define and map flood hazards in the community. Following the Spring Creek flood in 1997 - the largest storm event ever recorded in an urban area in Colorado - the city conducted a study of historical rainfall records, resulting in new rainfall criteria for designing stormwater facilities and mapping floodplains. Fort Collins floodplains were remapped in 2004 based on these criteria. In the 1990s, Fort Collins adopted the "Watershed Approach to Stormwater Quality" to reflect the Fort Collins community's values regarding habitat protection and stormwater quality. In 2008, construction began on the Canal Importation Ponds and Outfall Project to address flooding and water quality problems in west-central Fort Collins. The portion of the project within the Red Fox Meadows Natural Area is a collaborative effort between the Stormwater Utility and the Fort Collins Natural Areas program. Fort Collins Utilities was the first in the state and among the first in the nation to offer its customers the option to purchase clean, renewable wind power 1998. The wind energy is provided by Platte River Power Authority, Fort Collins' wholesale electricity provider. In 2010, Fort Collins Utilities introduced the Green Energy Program which allows customers to purchase renewable energy. This option is for customers who are willing to pay a little more for their electricity to guarantee that it comes from the cleanest sources available. Fort Collins Utilities has put proactive energy and water policies into place for the 21st century, defining short- and long-term goals and strategies with a focus on sustainability leadership. As Fort Collins grows, the Utilities department continues to plan for the future and manage infrastructure assets, while providing the safe, reliable service established as a tradition early in the city's history. Click images for book PDFs.